← Boil Bacon In WATER? Cut 3″ squares out of black poster board and use a sharpie marker and mark the edges. Use a gold or silver paint pen and trace a square on top of each square as seen in the picture. Take a six inch length of ribbon (this can be color co-ordinated to work with the schools color just as the black poster board can be changed) and glue it to the top of the black poster board. Hot glue the black square with the square you made on it facing up to the small end of a mini Reece’s Peanut Butter Cup. Top with a small black sequin or bead to cover the glued ends of the ribbon to make a finished look. These would make great party favors or would make a great gift with several placed with tissue paper in a gift box. 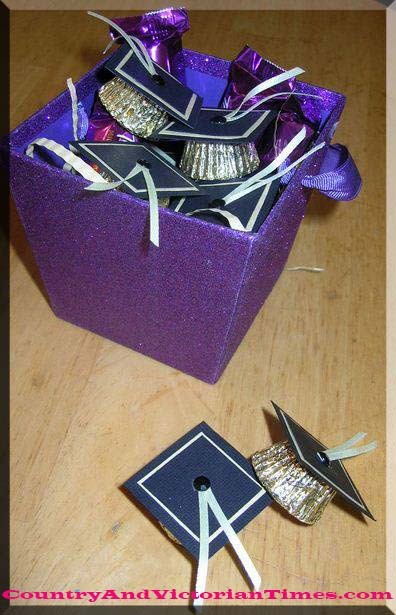 This entry was posted in Crafts ~ DIY ~ Projects, Recipes, ~Graduation, ~Party and tagged butter, cap, college, cup, favor, gift, grad, graduation, hat, high, Peanut, Peanut butter, reece's, school, tassel, ~Party. Bookmark the permalink.